在 07-06-2012, 8:43 下午 由 bluekid 發表.第 33 篇回覆. The value of the contract was not known. 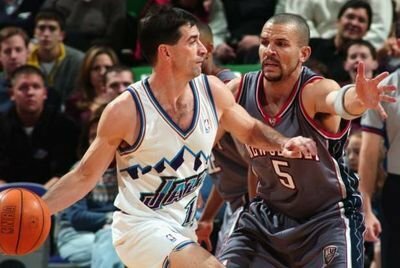 In an unforeseen reversal, Jason Kidd has decided to leave the Dallas Mavericks to join theNew York Knicks, according to sources familiar with the decision. With the Mavericks confident that they were closing in Thursday on a verbal agreement on a three-year deal with Kidd worth $9 million, sources told ESPN.com that Kidd -- after all-day deliberations with both teams -- has decided instead to leave Dallas to join the Knicks for a similar deal. The contract can't actually be signed until July 11, which is the first day new NBA contracts can be signed. It's also possible, one source said, that Kidd could ultimately move to the Knicks in a sign-and-trade deal. Sources briefed on the matter told ESPN.com that Kidd was ultimately swayed to take the Knicks' offer to come to New York and take on the challenge of trying to help the Knicks move into the Eastern Conference and also mentor fans darling' Jeremy Lin.